in and of itself renders his work unique, and well worthy of the attention and respect that even the most critical of JAZZ instrumental affectionados pay to his music. This is not simply mindless technique, but a very tasteful combination of Jazz, soul, funk, flamenco, and Brazilian stylings. The artistic concepts of this artist cannot be contained in just one language, FRANKY THE GENIUS composes in 7 different languages, engaging the listener in the unique magic that each language has to offer. English, French, Portuguese, Spanish, Hebrew, Arabic, and Wolof, all come into play for the artistic expression of this amazing indivdual. FRANKY THE GENIUS invites you to share in his universe to see his unique view, whether you speak many languages or not and enjoy the "world Jazz thing". Born to a mixed heritage of African, latino, and Cherokee ancestry, Multilingual Poet/Composer & Jazz guitar virtuoso FRANKY THE GENIUS comes into the world with a set of circumstances that found a particularly appropriate vehicle of expression in music. But more than just technique is involved here, the subtle and tasteful mix of JAZZ, BRAZILIAN, FUNK, AND CLASSICAL stylings make for a very pleasant musical experience. Whether playing solo guitar Jazz standards, or in an ensemble setting playing his elaborate compositions, FRANKY THE GENIUS fascinates audiences all over the globe with his ecclectic music and citizen of the world style. organizing festivals in Canada, Africa, and Brazil. "Cara a cara com o impossivel" ( face to face with the impossible), and appears regularly on Brazilian and US cable TV. 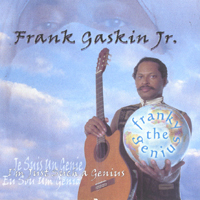 FRANKY THE GENIUS is also the author of 2 books on music: The Frank Gaskin method of guitar mastery.